Recently I came across Tableau and tried to visualize the data from database and csv file. 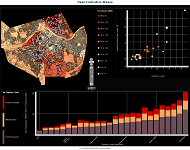 The user iterface enables the user to visualize time and spatial data and create plots in an instant. Such tool is really useful as it enables to observe the data graphically without writing the code. As there are many data sources from which I have to retrieve and visualize the data it would be very useful to have a tool which enabled to generate charts by simply dragging columns on axes and additionally modify the visualization with dragging the column names as well. Does anyone know any free or open source software of that kind? I've never tried it, but there's an open source desktop / browser-based visualisation suite called WEAVE (short for Web-based Analysis and Visualization Environment). Like Tableau, it's intended to let you explore data through an interactive click-based interface. Unlike Tableau, it's open source: you can download the source code and install your own version on your own machine which can be as private or as public as you want it to be. Don't expect anything nearly as slick and user-friendly as Tableau, but it looks like an interesting, powerful project for someone prepared to put the time in to learning to use it. D3 for interactive visualisations in SVG (works in every browser except IE8 and earlier and old (v1,v2) Android phones). Raphael if you need SVG output to work in Internet Explorer 6, 7, and 8. Tip: If you decide to work with Raphael and the latest version is still 2.1.0, I'd advise applying this bug fix to the code). If you're interested in the web programming option, here's a slightly more detailed write-up I wrote on Raphael and D3 for stackoverflow. Raw by Density Design - blog introduction - (hit "Choose a data sample" to try it out) - mostly copy and paste based, not sure if it has an API that can connect to a database but good for trying things out quickly. Tableau Public - a free-to-use online version of Tableau. 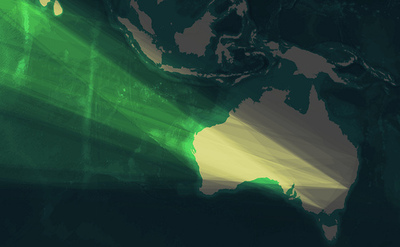 The catch is, the data you enter into it and any visualisations you create must be publicly available. WEAVE is the best GUI-based open-source tool I know of for personal visual analysis. The other tools listed are top of the range tools for online publishing of visualisations (for example, D3 is used by and developed by the award-winning NY Times graphics team), and are more often used for visualisation in the context of public-facing communications than exploratory analysis, but they can be used for analysis too. Point and click interfaces seem easier, but in the long run you will benifit by learing "writing the code". One advantage of script based systems over point, click, drag interfaces is the audit trail/history (some GUIs do have a history, but they generally are not as easy to work with as a saved script). If you write some code to create your graph and save it then it is always easy to rerun it, or to make some small edits then rerun, it is not always easy to remember the set of clicks and drags used to create a prior graph. Scripts will also be much quicker for large numbers of plots. It will take a little more time to write the code for the first plot, but adding only a couple of lines and some small modifications can let you loop through 100's or more variables with little additional effort where you need to do the same set of clicks and drags over and over again for each plot. Many of the script based plotting tools do have GUIs that allow you to use point and click to get started, but help you learn the code and transition to the more powerful methods. I recommend R which is free and open source and does have some GUIs available (Rcmdr, jgr, rstudio, etc.) as a good option. The online version lets you upload any csv/excel data and quickly visualize it. You don't need login for that. If you want to work with databases then you will need to login or you can download the software. I would use SCaVis data analysis and data visualization program. It is written in Java and runs on any platform, including Mac and Linux. You can also prototype charts using Python. There actually is a correct answer to this question, Orange. It was already around 2.something release at the time the question was posted. On Linux-based systems it can be simply installed through the Python Package Index with pip install orange3 and it is also in the Arch User Repository for Arch Linux, Manjaro, ALARM and other Arch-based distros. Also, there is a practically the same question on StackExchange mentioning a few more commercial/web alternatives (which is closed and linking back here). A few more can be found on Quora, but Orange is the only open-source, compiled and having a GUI at once that I know of. It has a rather perfected, aesthetic and minimalistic interface in my opinion. Maybe http://www-958.ibm.com/software/data/cognos/manyeyes/ is what you want. Beware that the data you upload is public though. Edit: Sorry, I see you asked for open source. My bad. There is also a young program for (automated) reading, filter, process, interpolate and plot n-dimensional values from different sources (like libreOffice- or csv-files) and variable size: diaGrabber. You have to use some simple python-commands to create a case. After this you can manipulate the graphical output in an interactive GUI. Not the answer you're looking for? Browse other questions tagged data-visualization software interactive-visualization or ask your own question. Open source tools for visualizing multi-dimensional data? Examples of wrapping open source machine learning software in PMML? Good statistical software system for teaching response surface design? Does anyone know how this visualization was made?